MCP1664 click contains 4 high-power white LEDs. 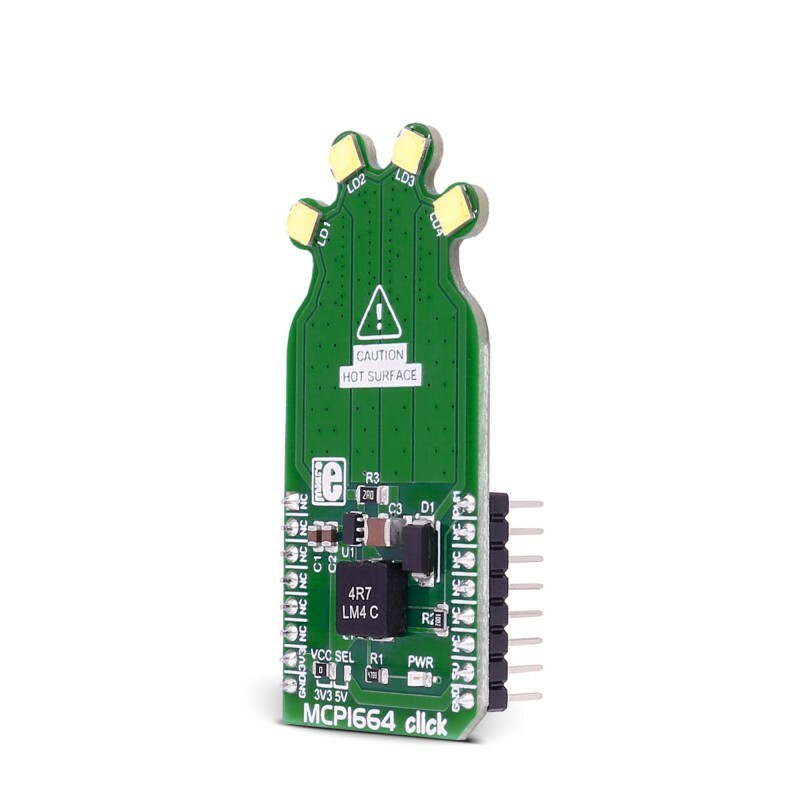 It carries the MCP1664, a high-voltage step-up LED driver from Microchip. 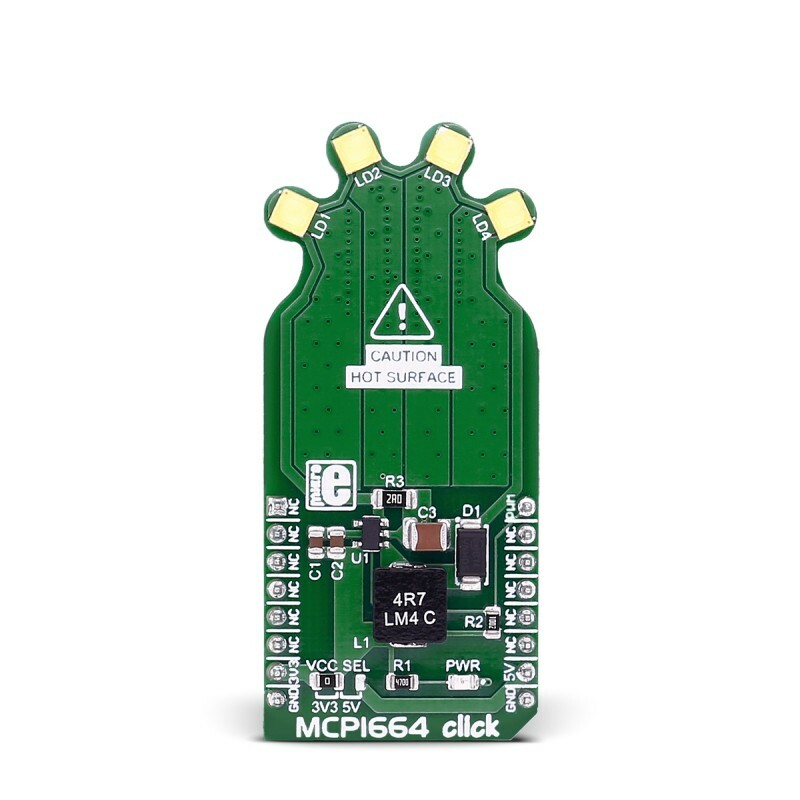 MCP1664 click is designed to run on either 3.3V or 5V power supply. It communicates with the target board microcontroller over the PWM pin on the mikroBUS™ line. MCP1664 click contains 4 high-power white LEDs. 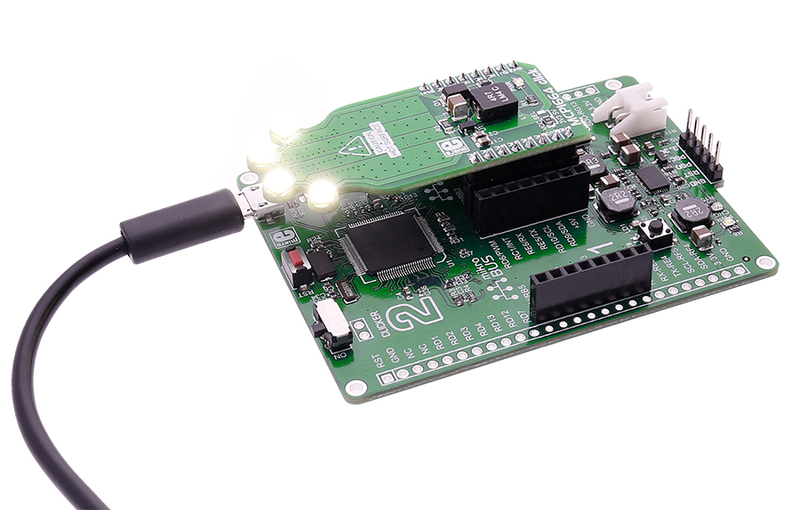 It carries the MCP1664, a high-voltage step-up LED driver from Microchip. MCP1664 click is designed to run on either 3.3V or 5V power supply. 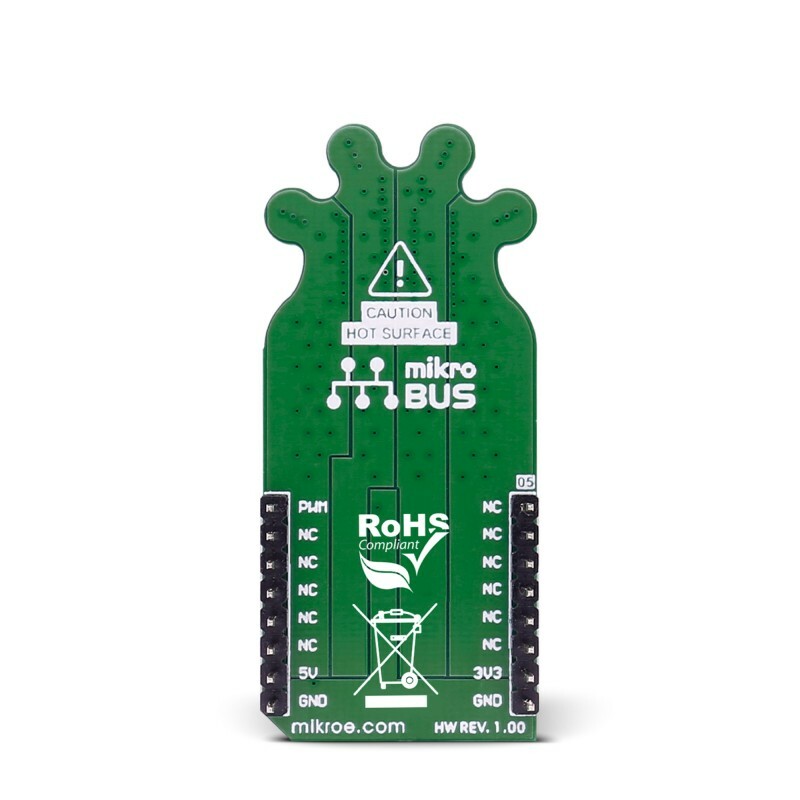 It communicates with the target board microcontroller over the PWM pin on the mikroBUS™ line. Note: Don't look directly at the LEDs while they are on, you could damage your eyesight. The click has a power input and a PWM input, so you can set the light intensity at the level you want. The MCP1664 is a compact, space-efficient, fixed-frequency, non-synchronous step-up converter optimized to drive multiple strings of LEDs with constant current powered from two and three-cell alkaline or NiMH/NiCd as well as from one-cell Li-Ion or Li-Polymer batteries. 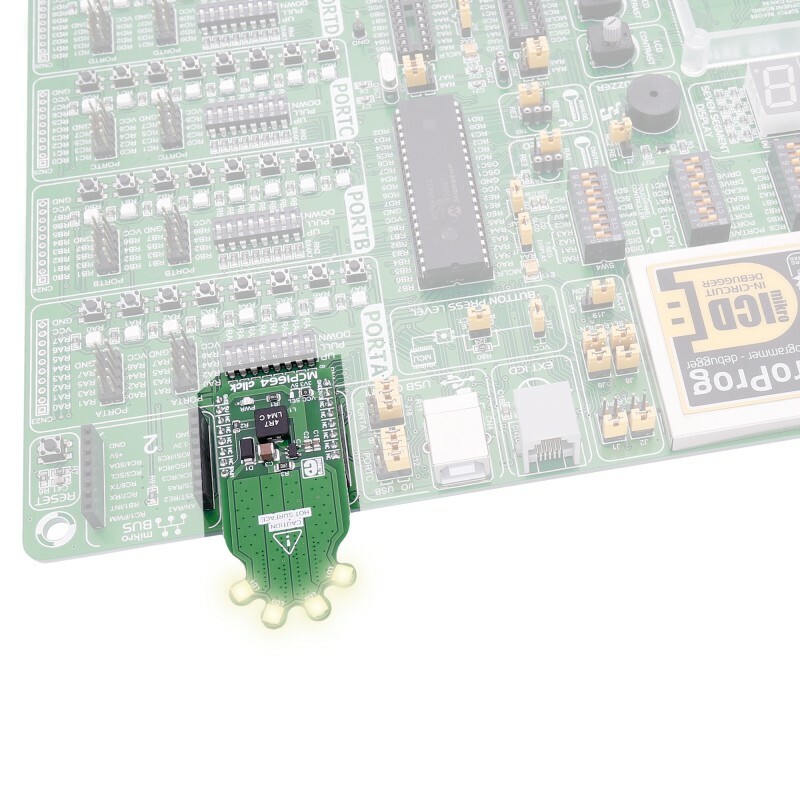 The MCP1664 features an open load protection (OLP) which turns off the operation in situations when the LED string is accidentally disconnected or the feedback pin is short-circuited to GND. While in Shutdown mode (EN = GND), the device stops switching and consumes 40 nA typical of input current. Applications White LED Driver for Backlighting Products, Li-IonBattery LED Lightning Application, etc. This code snippet shows basic control of light brightness with PWM. The duty cycle is controled with the potentiometer P1.